Profitability in the cattle business starts with producing a live calf every year that puts on pounds efficiently. Those live calves start with getting cows bred and rebred in a timely matter. Evan Farnsworth, owner of Farnsworth Angus Ranch at McHenry, N.D., understands this need to stay profitable with his herd of approximately 150 registered and commercial Angus cows. “Conception rates are a huge thing in the cattle industry, especially for the commercial side. The sooner you get calves on the ground, the more they are going to weigh in the fall, come pay day,” he said. Farnsworth relies on a high-quality mineral program to keep his herd in top shape year-round. He switched mineral programs at the suggestion of a fellow Angus breeder who was experiencing similar challenges with conception rates. Once Farnsworth made the transition, he saw a significant change is conception rates while shortening his calving window, both important traits for his overall goals. Since Farnsworth has made the transition to the VitaFerm® mineral program, he has chosen three minerals to keep his entire herd on through the year. 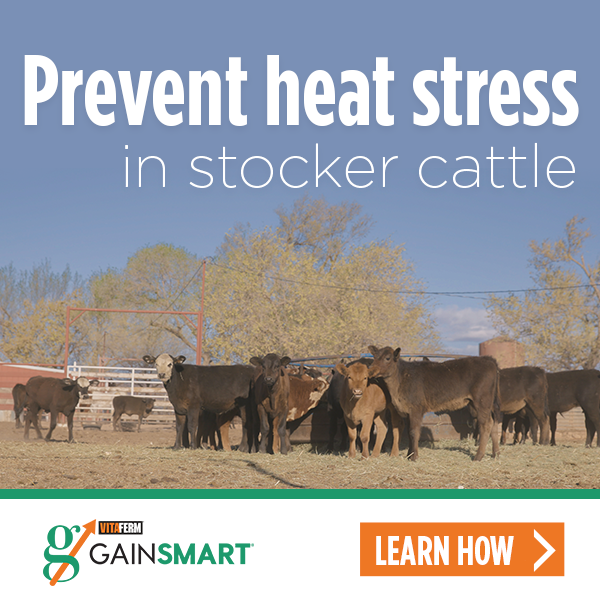 He feeds VitaFerm Concept•Aid® 45 days before calving until May 20, then transitions his cattle to the VitaFerm HEAT® mineral so they are on it and adjusted two weeks prior to breeding. Once the hot summer days are over, he puts his cattle on the VitaFerm Cow-Calf mineral during the fall. Keeping his cows on a high-quality mineral program year-round means Farnsworth never has to wonder about their nutritional health. In addition, he keeps his bulls on the same mineral program for consistency sake, he says. And, having healthy productive bulls is important since he markets his bulls privately off the ranch and sells some through the North Dakota Angus Association sale. He typically runs his commercial cows with the bulls for 75 days. His registered cows are A.I.-bred and then turned in with the bulls. However, in 2018, he had more cows get bred on the first cycle and significantly tightened his breeding window. “Last year, I got 96% of my commercial cows bred on their first cycle, and when we ultrasounded, only had 3% open. I also dropped from a 75-day calving window to a 53-day calving window. That is a big-time change, just from the switch over to the VitaFerm,” Farnsworth said. Likewise, with his registered cows, he moved from a 45-day to 32-day calving period, dropped from 4% to 2% open, and bred 97% on the first cycle, an increase of 12% compared to the previous year. The Amaferm® advantage in the VitaFerm mineral products that Farnsworth feeds plays a big role in his herd’s reproductive success. Amaferm is a precision-based prebiotic designed to enhance digestibility by amplifying the nutrient supply for maximum performance. It is research-proven to increase the energy available to the animal resulting in more milk production as well as to the ability to initiate and maintain pregnancy and fertility. “I feel like there is less stress on my cows from a nutrition and reproductive standpoint, since I’ve made this mineral switch,” Farnsworth said. In times where the potential for profit can sometimes seem questionable, isn’t it nice to be able to take control of one factor? Getting cows bred and rebred in a timely manner is the first step to creating profit.